Since I try to be honest with my postings I'll admit it straight away. This recipe is stolen from Jeans excellent blog Delightful Repast, her version with a very nice picture can be found here. In my view celeriac remoulade is just a slightly posher coleslaw but I find that it goes extremely nicely with smoked meats. One of our regular haunts, The Five Horseshoes, quite often have smoked dishes on the menu.Celeriac remoulade are more often than not part of those dishes. 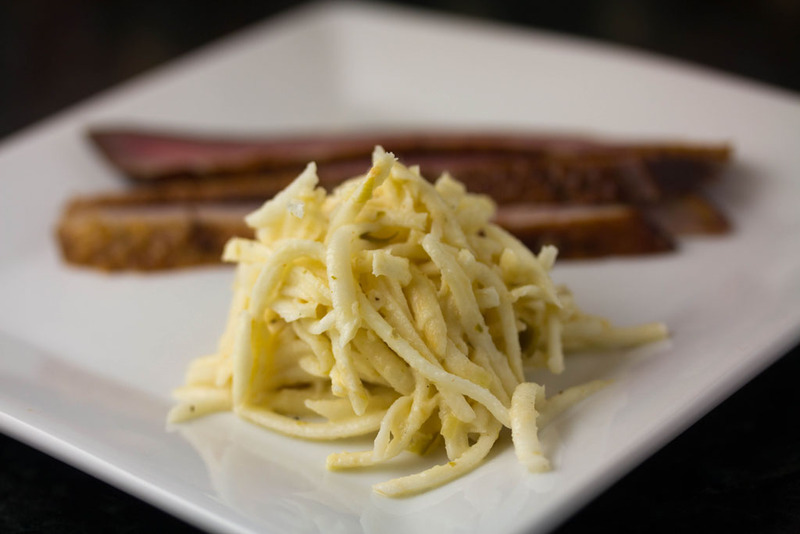 The inspiration from those dishes is what led me to want to make some celeriac remoulade to go with the smoked duck breasts we were bringing for New Years Eve. Some google-fu later and I had found Jeans excellent recipe and Robert was married to your mothers sister. The remoulade definitely benefits from staying in the fridge at least over night, the flavours generally gets deeper that way. I guess this is such a simple recipe that there's really no need for me to waffle on any longer. Let's have a look at how this is made. Just a quick note - you can of course cut/slice the celeriac by hand if you don't have a food processor. Clean up the celeriac root, trimming off all the nasty stuff. Cut the celeriac into smaller pieces that fits into the feeder tube of your food processor. Pop a shredder disk into your food processor and shred the celeriac. Put the shredded celeriac into a non-reactive bowl and toss with the salt and two tablespoons of the lemon juice. Cover the bowl and let this sit for about an hour. Mix together all the other ingredients and stir in with the shredded celeriac. Mike, I'm so glad you liked my recipe. And your photo is lovely. I, too, think of it as a posh coleslaw! Many thanks for letting me use your recipe and for the kind words about my photo. It is a very nice compliment to smoked foods and I think I might freestyle it a bit now that I've got an understanding as how to make a 'normal' one. Many thanks for the original recipe and inspiration! Great focus on this tasty looking side dish! Also nice way to introduce your readers to a blog you find interesting! Thank you very much. I always feel that it's better to give credit than to pretend that it's all my own recipe. Feels better that way. Besides, Jean's site is ace so she deserves all the visitors she can get.